2016 was another fantastic year for the global airline industry, as it reached record profits of approximately $35.6 billion. According to the International Air Transport Association, 2016 was the eighth straight year that the airline industry turned a profit. With the health of the industry staying steady, pilots across many airlines saw their paycheck trend in a positive direction. Analyzing the data submitted to APC from our community, we take a look at how much captains can expect to earn in 2017. Earlier in 2016, pilots at United Airlines approved of a two-year extension, which included industry-leading pay rates, placing them at the top of the leaderboard. The extension offers its pilots the highest ceiling and floor when it comes to pay. Following behind is American Airlines, whose pay increased by 3 percent on January 1st, and will continue to do so every year until 2019. After ratifying a new labor contract in 2016, Delta Air Lines comes in at third, with Hawaiian Airlines thereafter, although their pilots have yet to ratify a new contract. Rounding out the list is Alaska Airlines, who made headlines in 2016 by acquiring Virgin America. Southwest Airlines and Allegiant Air were the two major airlines who saw the biggest bump in pay in 2016. Southwest’s new contract keeps them on top of all major carriers, and will continue to provide major pay increases over the next four years. Allegiant pilots ratified their first union contract in 2016, which carried them from the bottom half of the group to the top half in compensation. First year captains at Allegiant receive $152 per hour. 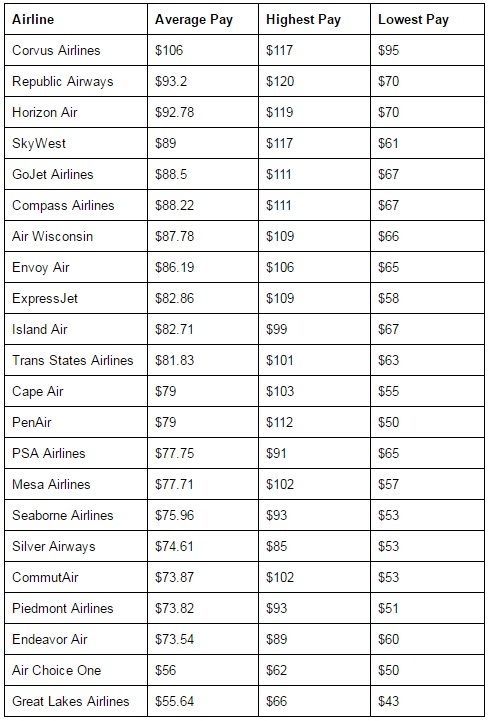 Calculating the pay of regional airlines can get a bit tricky, with most airlines offering substantial bonuses that can shake up the chart. 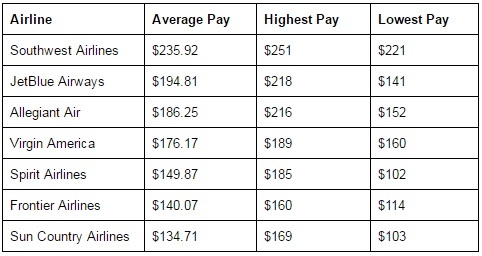 At first glance, Corvus Airlines leads the way in average pay, as they offer the most for first year captains, with Republic Airlines providing the highest pay for captains with 20 years of experience. However, with per diem and other benefits taken into consideration, Republic offers industry leading pay to their pilots. Many regional airlines offer generous bonuses including Piedmont Airlines, PSA Airlines, Envoy Air, Endeavor Air, and more. Be sure to visit our regional airlines page to visit their profiles.